Gordie Howe, better known as, “Mr. Hockey”, played over 30 seasons of professional hockey and is one of the greatest players of all time. A 23-time NHL All-Star, Howe held many of the sport's scoring records until Wayne Gretzky came along, but still holds NHL records for most games and seasons played. Howe won four Stanley Cups, won six Hart Trophies as the league's most valuable player and won six Art Ross Trophies as the leading scorer. Howe was inducted into the Hockey Hall of Fame in 1972. 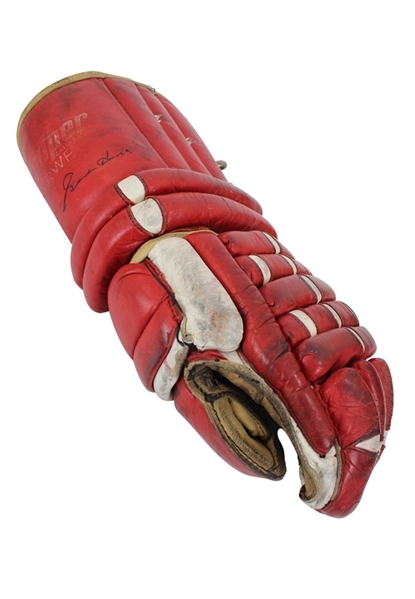 Offered is a single Cooper manufactured left handed red glove with white trim attributed to Howe’s final home game with the Red Wings. On the wrist reads “Cooper CANADA RWP” and “Red Wings”. On the palm is a tag reading “Cooper CANADA”. The glove exhibit heavy wear with numerous scuffs, board burns, holes and other marks from Howe's clenched grip. The leather ties are still intact. Howe signed the top of the glove on the inside wrist in black marker and in our opinion the signature rates a near 9. This glove is properly tagged and was presented to us as game-used attributed to Howe’s final home game with the Detroit Red Wings. Accompanied by a statement detailing the lineage of the glove originally coming from Howe, a picture of Howe with the glove and a LOA from JSA.